We are a family business and pride ourselves on customer satisfaction. We do our part to be eco-friendly and save the Earth. We offer free pick-up and delivery to make things easier for you. Professional Dry Cleaning Bubbles Dry Cleaners is famous for the tender loving care we give to every customer’s wardrobe Expert Alterations & Tailoring We have professional tailors who can mend your clothes making them better than before Pick-Up & Delivery Conveniently schedule your laundry pick-up or delivery by submitting your request online. We’ve all got favorite outfits that we like to wear for that extra special occasion. That’s why Bubbles Dry Cleaners is the place for you to entrust your precious clothes; we’re the Hollywood dry cleaner that gives your clothes the star treatment they deserve. Located on Vine Street between Hollywood Boulevard and Selma Avenue we’ve been treating your clothes with the utmost in care for over 15 years. We services Hollywood, Los Feliz, West Hollywood, and more. We’re a family owned and operated business that prides ourselves on not just washing, drying, and folding your clothes but actually taking care of them the same way you would. We offer a variety of services to keep your clothes in the best shape possible, so if your clothes are in need of some love and care give us a call today at 323-461-6050 to learn how we can give your clothes the star treatment. At Bubbles Dry Cleaners, our state-of-the-art machines are so efficient we are able to handle batch after batch of sparkling clean clothes in an efficient manner which allows for a very fast turnaround time. With our free parking, competitive pricing, quick turnaround times, and amazing customer service we make sure that we’re not just caring for your clothes, but we’re caring for you every step of the way. We want to make the entire dry cleaning process as convenient as possible for you. The next time your clothes are in need of that loving caring touch, call us at 323-461-6050 and we’ll make sure to give you the expert service your clothes deserve. Do you live nearby? We offer pickup and delivery services within the 5-mile radius of our shop. We want to give you the convenience you're looking for. A pleasant dry cleaning experience awaits you at Bubbles Dry Cleaners. Drop-off Pick-up parking available in front of Bubbles. You can get a pick-up or delivery schedule by submitting a request online. We not only care for your clothes we care for you! 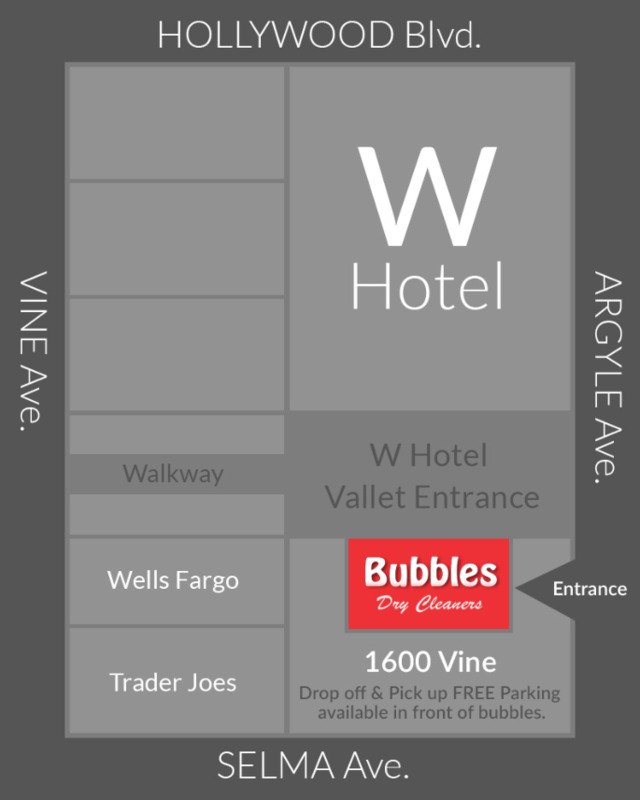 We offer free Parking at W Hotel entrance off Argyle.